Scientifically-proven efficacy for treating constipation (increases stool viscosity and stimulates peristaltism). 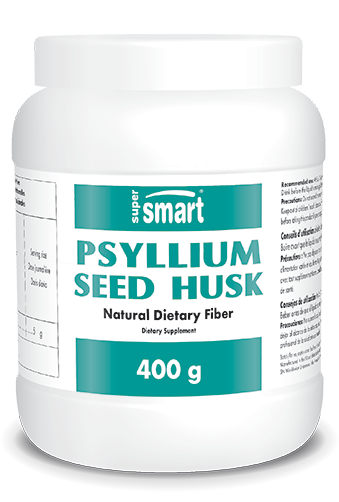 Psyllium Seed Husk (Plantago ovata) is an excellent, non-caloric source of soluble fibre (eight times more effective than oats) which supports healthy, regular intestinal elimination and helps regulate blood sugar and cholesterol levels. Psyllium is grown in northwest India and has been used in ayurvedic medicine for thousands of years. Psyllium seed husk consists almost exclusively of hemicellulose which acts like a sponge in the intestine, improving the consistency of stools, promoting peristalsis and facilitating intestinal transit. Its action is purely mechanical - the body does not assimilate it - and it can therefore be used as a laxative without any risk of dependency or toxicity. A healthy colon is the body's first line of defence. Regular fibre intake can help control the negative effects of chronic toxicity created by over-exposure to environmental and dietary pollutants, processed foods, excess caffeine or alcohol, stress, lack of exercise, and antibiotic use. Fibre accelerates the elimination of mucous, toxins and metabolic waste products from the body helping to maintain a healthy colon and intestinal flora. Since 1997, psyllium suppliers have been authorised by the American FDA to refer to the inverse correlation between soluble fibre intake and coronary heart disease. Given its low cost and multiple health benefits, it makes good sense to supplement the diet with 5 grams of psyllium a day. Other ingredients: magnesium stearate, rice flour, silicon dioxide.